For those of us who became parents in the 1990s, there are things that we experienced that young parents of today will never understand. Like how devastating it could be when a VCR tape broke. Or when a roll of film was over-exposed and none of the pictures from your kid's birthday party came out. You know that happened. Here are 25 things you remember if you're a parent of the 90s. 1. Your maternity clothes were pretty much all really ugly, and your diaper bag was pastel colored. 2. You breast fed, but not for as long as you thought you would. 3. You missed out on all nearly all of the music of the early 1990s because you were busy listening to Radio Disney. Your car radio was no longer in your control. 4. This magazine cover made you crazy. Or you totally loved it. Either way, it was a hot topic. 5. You wore overalls because they had lots of pockets for all of your kids' junk -- almost more than because they were in fashion. 6. You can still sing the entire repertoire of Raffi songs, and will run screaming from a room if someone even mentions Barney the Dinosaur. 7. Your children wore clothes from Gymboree and Gap Kids. 8. You watched Friends and missed being single, then watched The Cosby Show and felt glad you had a family. 9. In the early years, you wore mom jeans, not ironically. Also vests and pleated pants. 10. You watched The Little Mermaid at least a bazillion times on your VCR. 11. Ditto Beauty and the Beast. 12. Ditto The Lion King. 13. You had Snackwells cookies in your house -- for you, not your kids. 14. Your kids played with at least one of these things: Beanie Babies, Power Rangers action figures, Tomagotchi pets, Pokemon cards, or Pretty Pretty Princess. You bought a Razr scooter (or two, or more) for an obscene amount of money when they debuted because they were impossible to get. 15. 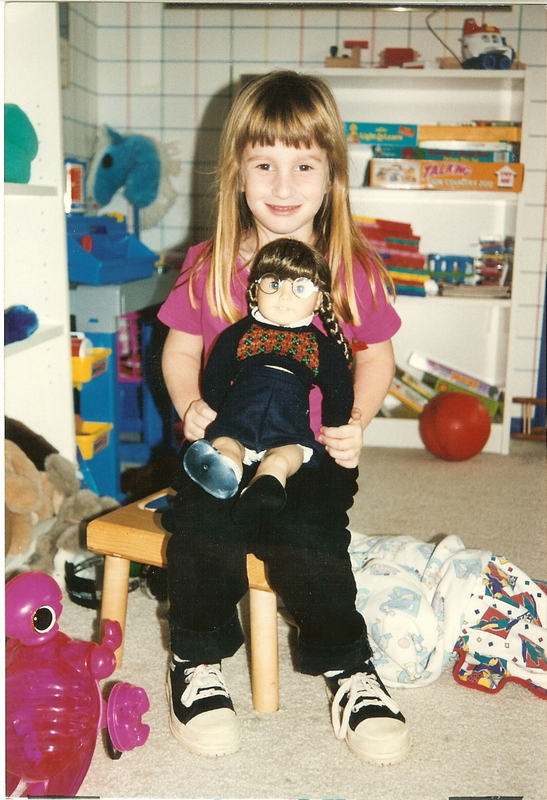 If you had a daughter, she wanted an American Girl doll. 16. The hottest toy ever was a Game Boy. 17. Your house in the early years had one of the following: a dried wreath or flower arrangement, stenciling, whitewashed furniture or floors, sponge painting, an ivy trellis border, golden yellow walls, a distressed wood dining table or a Chevy Suburban in the driveway. 18. You were startled the first time you realized you had to buy a second (then third and more) computer for your house. 20. You were shocked when More magazine debuted in 1998 and you realized you were their target market. 21. You were first reintroduced to popular music after all the years of Radio Disney when your kids started listening to NSync, 98 Degrees, Britney Spears and Destiny's Child. 22. You had to explain 9/11 to your kids and didn't know what to say, because you had never experienced anything like it. 23. You grappled with whether to get your kids cell phones when they started high school. 24. You snooped on your kids MySpace or LiveJournal pages. 25. You sent them off to college in a way parents never had before, connected on a daily basis through texting, Facebook and other social media.